Find out about the new ESTEE LAUDER CyberWhite Extra Intensive BB Creme SPF35/PA+++ that conceals, protects, nourishes and perfects in one single touch. YOUR One Final Step to Beautiful Skin. Limited to the first 2,000 redemptions at counters only. 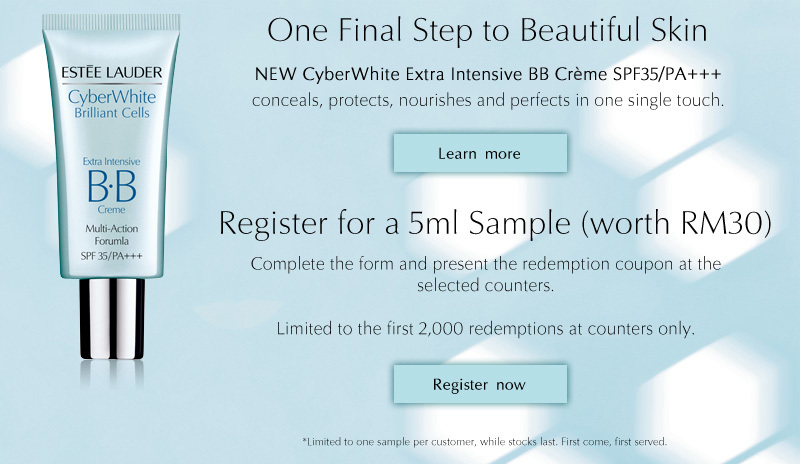 Visit ESTEE LAUDER CyberWhite Extra Intensive BB Creme SPF35/PA+++ form now! * Limited to one sample per customer, while stocks last. First come, first served.